It was bizarre. May be that is how any conversation between any Chappell and any Ganguly transpires. I didn’t know which was weird: the commentary or India’s batting out in the middle. It had been an hour and half of poor cricket: Gambhir came and went, Sehwag lived on the edge before nicking one to Ponting who promptly dropped it only for Pattinson to send back Sehwag shortly thereafter. Dravid and Laxman look more like the Dravid and Laxman of 1999-00 than of 2003-04. They struggled. 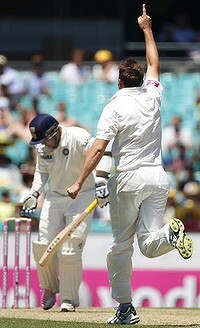 Tendulkar and Kohli took India to the brink of lunch when Clarke summoned Hussey to deliver the final over. After 20 minutes of rambling, finally Ganguly and Chappell struck a conversation. Ganguly: This is a smart move by Clarke. Everyone expected him to bring in Lyon for the last over, but he springs a surprise. Tendulkar has a history against these dibbly-dobbly bowlers. He hated facing Hansie Cronje. Chappell: Then he must have nightmares facing Kiwis! I pictured Greg Chappell chuckling at this back home and perhaps throwing a couple of air punches in delight at his brother’s clever retort. Ganguly: Not sure about that Ian, but am sure you guys have problems. You just lost to them in Hobart last month! The cameras panned to the Indian dressing room and they were clapping. You’d think for Tendulkar. Surely, they were clapping for Sourav. If you can take out two Chappells in one sentence, it is worth more than the Border-Gavaskar trophy. I punched the air in delight. At least waking up at 4 in the morning didn’t go waste. We were one up going in to lunch even if the score card said something else! And that was that! Nothing went India’s way. Even a determined Tendulkar who looked in tremendous form dragged one on to his stumps. It was another day of good fast bowling by the home team. Their lengths to the Indian top-order would have done their bowling coach, McDermott, proud. Pattinson set up Sehwag and Laxman with the guile of a veteran while Siddle bowled a hostile over to knock over Kohli who had looked very comfortable till then. Between the three quick men, they had India in knots for the third successive innings. Given India’s repeated weak response to good quick bowling, the three quick men will fancy a rich harvest this summer. Jokes of Indian batsmen’s lack of patience and feet movement fill the entertainment sections of Australian newspapers. “If you want to see fancy Indian footwork, bypass the SCG and take in a Bollywood musical,” read one of the newspapers. And the taunts of No Country For Old Men seemingly now a dig at the Indian middle-order than their own ageing greats. It has been a miserable time for Indian batsmen over the last one year playing outside of India. No longer can the batting unit continue to surrender meekly. Yes, the Australian bowling has been hostile and good, but the application and hunger they were famous for seems lacking. It is highly unlikely that they will all survive should this series pan out like their last English summer. All is not lost. There are another four days left in this Test to redeem themselves. Meanwhile, Ponting, Clarke and Hussey will know that two sessions of batting tomorrow could well seal the Test in their favour.